It’s no secret that choosing the dress you’ll wear on your Quince comes at top of your TO DO list. It is also no secret that instead of choosing any design, one does the proper research to find out what type of dress works best for our body type. However, only a few Quinceaneras ask themselves which would be the best color to wear. These are merely suggestions, shades that will best highlight your skin tone. The models showcasing these dresses have different skin tones so FOR SURE you will rock any shade of the rainbow! This color will perfectly match your skin tone. This is the perfect color for chicas with dark-brown and light-brown hair! This soft pastel XV dress will highlight hazel, green and blue eyes and light brown or blonde hair. If you’re planning a Cinderella Quinceanera, this is your color. 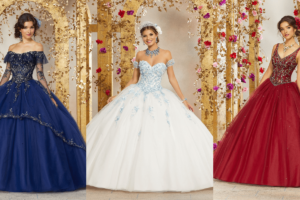 For darker-skin Cinderella Quince girls we recommend royal blue shade. We’ve never seen it and it is definitely a color that must become a trend in the Quinceanera world. Unique and classy, need more? Champagne compliments most skin tones. Boring people think of gray/grey as a boring color to only be worn during winter time. The last part is not exactly wrong; however there is nothing boring about this magnificent color! Gray is classic and properly combine it can create elegant and crazy party themes. Think Cinderella Quinceanera once again! Opting for a darker color when your skin is dark is the best way to accentuate your tone. Don’t be afraid to be the center of attention, it is your fiesta after all! How gorgeous is this dress? And you thought you would look like Big Bird when your mom suggested yellow! Perfect for a Beauty and the Beast Quinceanera (choose a light shade yellow)! OMG, Look at her shine! You won’t need an apple for your guests to fall under your spell; a bright red Quinceanera dress would do it for you! Matching it with black will make you look darker; matching it with silver will make you look lighter. 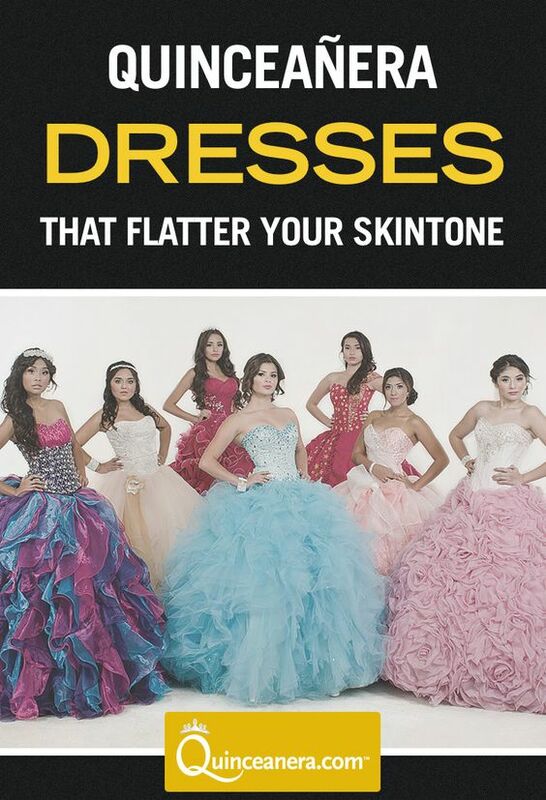 Do your research and before choosing the theme for your Quinceanera or the color of your dress, keep in mind not just your body type but your skin tone, the color of your hair and eyes.